Dr. Lu is a clinical supervisor at Bastyr Center for Natural Health and runs her own private practice. She has been in practice since 1997. Dr. Lu received an MD from Harbin Medical University in China, where she worked both as an intern and as a physician in various hospitals. She received an MS in acupuncture from Bastyr University. 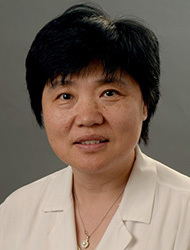 Dr. Lu also is a member of NCCAOM.